Imua (ee moo uh) forward! No paddler should correct, “help” or advise another. Obey the steersman and coach always. Keep your attention on your own improvement. Keep a spirit of fun and aloha while paddling. 2. Check the rigging is tight, fore and aft plugs are in and there is no puka in the ama or canoe..
4. Assign seats. Be sure to rotate seats so that each paddler learns each seat. 6. When the wind is up, hug the shoreline and stay with the other canoes. During paddling, the steersman should encourage the crew, reassure the crew (e.g. “I see that wave, we’re fine”, “ama concious, please”) and correct the crew (tactfully!). It is better not to tell an experienced crew to “pull hard” since they already are and this will irritate them. Although the steersman has both ultimate responsibility and ultimate authority, s/he must take care to serve the crew in a way that makes the experience fun and rewarding. Novice steersmen must strike a balance between their own imperfect knowledge of technique and their role as a helper coach for their crew by asking the Coach what to say in correcting their paddlers. A rule of thumb in any type of training situation is that the ratio of your positive comments (“That’s it!”) to corrections (“seat 3: you’re rushing”) should be about 10 to 1. If you are finding yourself doing more correcting than encouraging and praising, it might be good to be silent for a while. Some experienced crews paddle in complete silence except when the steersmen ques them to catch a wave. Seat 1 sets the pace and should strive to paddle at the same rhythm throughout unless catching a wave or doing a racing start. 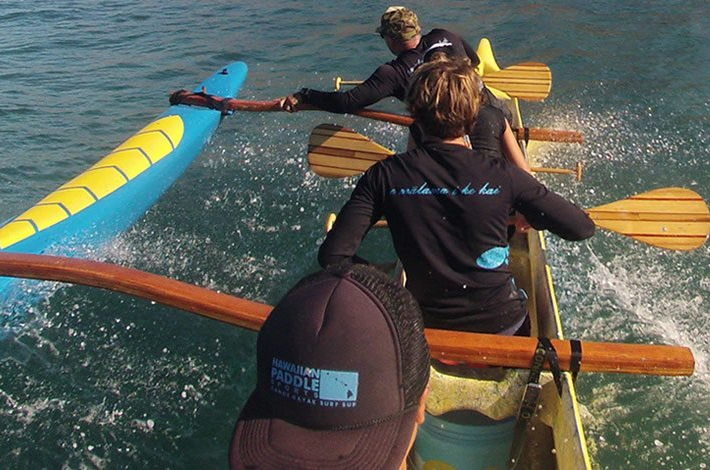 #1 can feel the paddlers, the waves and the conditions and experiment with the pace until the crew syncs up. It is the job of everyone else in the boat to imitate the stroke, rhythm and body motion of the stroker whether they think s/he is doing it “right” or not. By definition, the stroker’s way IS the “right way”. However, good strokers can feel the crew and conditions and adapt the stroke and pace to get the best out of all 6 paddlers. While going upwind the stroke rate will be slightly slower than downwind. Pick up the stroke rate when going downwind or with the swells. #2 talks to #1 but only if #1 wants it. Before starting out ask #1 how much and what type of talking s/he wants. Some #1’s just want encouragement. Some want to know when they are not reaching enough. Some don’t want any talking. Find out. Seat #2 is one of the more important seats since if #2 is out of time, half the boat will be off. Seat #2 is also responsible for leaning on the ‘iako when the boat is at rest or about to huli. Otherwise is silent. Calls the changes (Hut, Hu). Otherwise is silent. 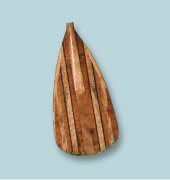 When the canoe is in surf, 3 should call changes when the nose of the canoe comes up and it wallows behind the wave. 3 should not call when the nose goes down and the crew is trying to catch the wave. You may call once the canoe is solidly being swept along on the wave. 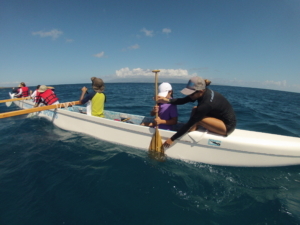 In the open ocean, the waves usually come in a regular pattern so that 3 can find the optimal number of strokes per call so that the crew is not changing when trying to bring the canoe down on the wave. Don’t stubbornly call on 15 when the waves are coming on 18. In irregular surf, shorter (12 count) calls leave some room to hold the count longer (up to 20) when catching an unexpected wave. Try not to space out and leave your crew on one side for 25 or 30 counts. Tahitians call on 9. In Hawaii we call between 12 and 20. 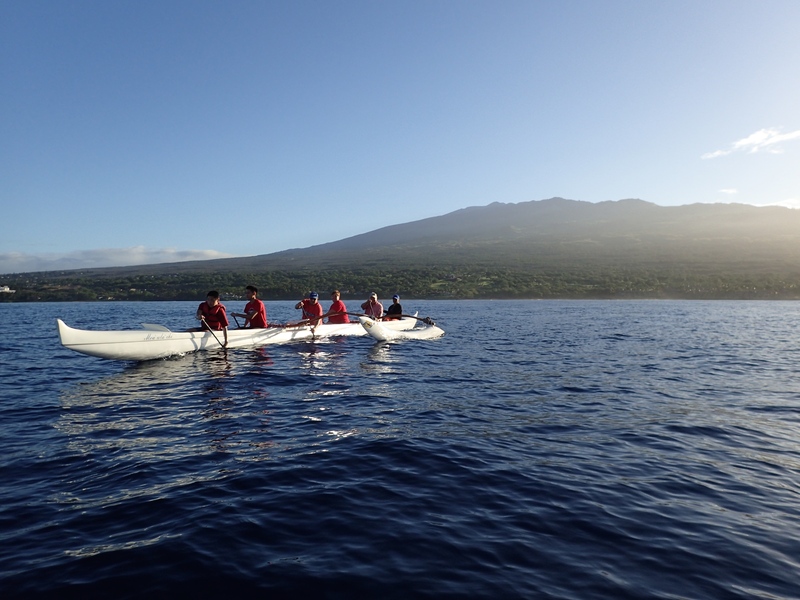 Seat 4 is responsible for leaning on the ‘iako when the boat is at rest or about to huli. Is silent. Except as noted above, seats #1-5 should be silent. 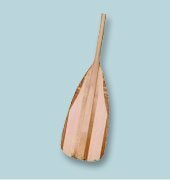 It creates friction and makes an unsafe canoe for seats #1-5 to correct other paddlers, argue with or contradict the steersman, give advice, or give orders. If you think a steersman is wrong, obey him/her anyway with a respectful attitude and talk to the coach once you’ve reached shore. On no account should you stop paddling unless the steersman calls “lawa” since the steersman cannot control the boat if the crew isn’t paddling. This is of utmost importance in challenging conditions such as a wave about to hit the boat, the boat needing to make a sharp turn or when coming into shore. To repeat: Crew should NOT give advice or orders, argue with the steersman, or stop paddling! The safety and cohesiveness of the crew depends on the steersman being obeyed exactly and immediately. Do not weaken the trust of the crew by undermining the steersman’s authority. Don’t think that just because you have more paddling years than the steersman, that makes it OK to talk. It doesn’t! A divisive boat is an unsafe boat. 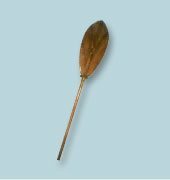 Traditionally, the steersman has the right to throw any paddler out of the boat (anywhere — even offshore) if s/he is not cooperating. 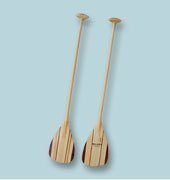 Why should a canoe paddle be made from wood? Wood lasts longer since it doesn’t chip as much and can be easily refinished to new condition. Wood is easier on your joints since it has a slight flex. 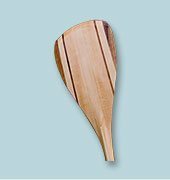 Any wood paddle is more beautiful and traditional than a non-wood paddle. Check that the fan housing is closed down as much as possible (the lever should be in the lowest position) This minimizes drag and makes conditions as much like water as possible. Press the Watts/sec/500m toggle switch on the right until the center display says “Watts”. Adjust the seat so that your feet are comfortable on the ground and optionally brace one against the machine’s feet (not the pegs up in the air). One foot should be farther forward just like when you are paddling in the canoe. For specific distance: Press the “meters” button. Use the right arrow key to position over a number you want to change. Use the up/down arrows to get the digit you want. When the meters is correct, press OK. Begin paddling. The display will sense your strokes and begin timing. If you paddle too slowly or too weakly, the display will show bogus (too high) numbers which will result in an erroneous session average (too high). You can press the right “Watts/sec/500m” toggle switch to bring up whatever type of display you want during paddling and after pau. Winning woman’s crews have paddlers who can all maintain at least 80watts over an entire 2 minutes or 500 meters BUT they also have at least two woman who can maintain well over 100 watts for the entire 2 minutes or 500 meters. Winning men’s crews have most paddlers maintaining over 180 for 2 minutes or 500 meters with some men that can get well over 200 for 2 minutes. Height plays a big role in how much power a person can generate on the erg and men under 5’9″ will expect to be at 130 or 140 watts. How can you get stronger? Weight training and training on the erg are essential to become a winning paddler. Train on the erg the same day you paddle and rest 1 day between. If you don’t rest, you will not build muscle – you will just tear it down and get weaker. On your alternate days, run or bike. Do not use the erg on Friday before a race. For long distance, give yourself a rest from the erg several days before your race. The upper left display shows you elapsed time or meters if you’ve set a distance goal. The upper right diplay shows strokes per minute. Aim for 60 to start. You can increase this once you are experienced at pacing yourself. The center display shows you the power on each stroke (if you’ve set it on watts) or it may be displaying the time it would take to do 500 meters (it changes with the right toggle switch). The higher the number Watts (or the lower the time), the stronger you are. I like to keep the center display on Watts even while I am paddling for a certain distance goal. That way I can mentally set a minimum target and increase my power when I start dropping below my target watts. The lower left display will toggle through: A) the average power over the time you have been paddling; B) The elapsed time for the distance you set; or C) the time it would have taken you to paddle 500 meters. The numbers that count for comparison purposes are: Watts and Elapsed time (for a distance goal). Off season. No practice! Ahhh….time to relax! Not so fast! This is the time to weight train for next year. Once you’ve learned paddling technique, the next step is to increase your power. Weight training is the way to do it. Hit the gym every other day. If you go more often, you’ll want to rotate your workout – for instance, arms and chest one day, legs the next. Research shows that you need a day rest between workouts on a muscle to promote growth. Otherwise you end up tearing down the muscle and actually getting weaker. However, you don’t need to wait 3 days just because you are stiff or have muscle soreness (no wimping out here!). You’ve heard “No pain. No gain”. It’s the truth. If you are trying to build muscle and you don’t experience sore muscles the day after a workout, you are not working hard enough. However, if you are experiencing pain during a workout – something is wrong! it won’t get the job done if you want to increase your strength. Your goal is to do 2 or 3 sets of 12-15 reps. But the weight should be set high enough that on your 2nd or 3rd set, you can barely do 7 or 8 reps trying your very hardest (I mean really pushing, arms or legs shaking!). Once your second set is consistantly up to 12 reps, it is time to increase the weight. Watch out that you don’t overstress joints or tear muscles. The idea is to push as hard as you can without damage. Sharp pain is a sign to change your position, change the machine or back off on the weight. Be sure that you not only train your pulling muscles (as used in paddling) but train the antagonists (pushing muscles). You want even development. This also prevents injury. For those without a gym, you can do pull ups (pulling) and pushups (the antagonist) and the triceps exercise. You turn your back on a chair, place your hands behind you on the seat of the chair, legs out in front and raise and lower yourself by bending and straightening your arms. If you have access to the gym, here is an alternate to pullups that I call the “Get in the Boat Exercise”. Stand facing the cable machine with the long, bent-end bar attached. Grasp the bar near the center, hands about 18’ apart. Starting position is hands reaching up above your head. In one motion, bring the bar down so that it is in front of your thighs as your arms point straight down. This mimics the action of pulling yourself into the canoe during a water change. When you can do this with somewhat more than half your body weight, getting in the canoe should be a breeze. It is very important that you get enough protein during weight training. If you find yourself dragging and tired, you may need to work very hard at adding protein to your diet by cutting down on empty calories (fat and sugar) and deliberately eating lean meat, fish, protein bars or drinks or, if you are a vegetarian, beans and soy. Even though I want you to work hard enough to be sore, I’m not a total sadist. So after you exercise, stretch out those muscles and drink plenty of water. That will reduce soreness. No kidding, though. If you are sore and stiff most of this winter, you’ll be amazed at the increase in your performance next summer. club activities that take place that need your help. When you get to the race site (which should be at least 1 1/2 hours before your race), check in with your coach and sign your entry form. If you are going to be late, let the coach know before hand and keep in touch with her/him by cell phone. We usually set up our tents very early on race day. The more club members present to help set up the tents, the easier the job becomes. We also have to take the canoes off the trailer, carry them to the beach, and rig them for racing. That’s a lot of work and the more hands we have, the easier the job. The canoes will have to come out of the water between races. You should help with that chore. Don’t hold boat 1 or 2 races before yours. The coach and your crewmates will have heart attacks! Help the steersman keep the wa’a straight so s/he doesn’t have to start the race by poking. BE SURE TO PUT BOTH HANDS UP IN THE AIR AT THE START OF THE RACE OR WE WILL BE FINED! Duck out of the way of the paddles but don’t push yourself off the boat or you’ll cause it to go crooked. Win or lose, each of our crews deserve our support. Having your fellow club members on hand to send you off and especially to greet you when you come back is important. If you have access to flowers or ti leaves, we can make leis for our returning paddlers. Paddlers who show up for their race then leave are missing out on a lot of the fun of being part of a club. Every racer is expected to help clean up our area, take down the tents, unrig na wa’a, and load them on the trailer. Usually, there is a dance with live music at the end of the regatta. Please be sure you stick around to load na wa’a on the trailer after the race at least one race per season! Bringing food (donuts, sandwiches,chips, sushi rolls, bread, cookies, etc.) is very much appreciated – especially by our keiki. Be sure to bring your own drinks (plenty for a whole day at the beach). If we get it together this year, we may organize different crews to bring dishes for a potluck on a rotating schedule – that will depend on whether the majority of racers want to do this. Alcoholic beverages of any kind are strictly prohibited at races (by the terms of our HCRA insurance policy and by Association rules). Any club whose members are found drinking before the end (the complete end) of the regatta gets a $250 fine. If a paddler swears during a race and is heard by an official or reported by one of the other crews, THE ENTIRE CREW IS DQ’d! and the club is fined. The best thing to do if you find yourself accidently swearing in the heat of the moment, is to say, “sorry, sorry!” and then be very quiet, hoping no one will report you.